The things in my house have started singing. They have the voices of those children who constantly, tonelessly incant when they want candy in the checkout line: Please please can I have it please can I have it please. Thus the objects in my house: The dishes play a constant game of tag moving themselves from surface to surface. Look at me I’m on the table, I’m on the floor, I’m in the sink. You can’t catch me you can’t wash me you can’t keep me in the cabinet! The papers just like the sound of their voices Lalalalalalalalalalalalalalala, they sing, so high-pitched that the neighbor’s dog will sometimes start to bark. I have tried to explain to my Giant Panda how I am reaching a breaking point, but it is hard for him to understand. He cannot hear the high-pitched wailing of the stiff socks underneath his favorite chair. This is not his fault. Because of his inefficient intestinal tract, he has to eat thirty to forty pounds of bamboo everyday, which takes him between twelve to sixteen hours of constant eating. So it is not surprising he cannot hear the lalalala of the utility bills over the CRUNCH CRUNCH of the bamboo splintering between his jaws. The noise must be deafening from inside his head, because it is loud even to my ears. Low pitched and percussive, it joins the singing choir, and I have to run out of the house. Fortunately there is always reason to leave, as I must go to the store often in order to purchase more bamboo. There are fifteen varieties of bamboo that a Giant Panda can eat, my Panda prefers only four of these. When, due to limited availability, I must bring home one of the eleven other varieties, my panda looks at me with sad eyes and sighs, and I feel bad for disappointing him. Sometimes I get resentful that he won’t expand his tastes, but then he is good and tells me that it’s okay, he knows I tried. He thanks me for bringing him the bamboo and asks if I wouldn’t mind chopping it up and putting it on a fresh plate for him, if I’m making something for myself anyway. On the weekends, my Panda likes to go to restaurants. 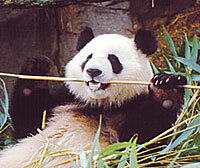 Even more than his four favorite types of bamboo, he likes to eat fresh bamboo shoots. Bamboo shoots, however, are not as filling as full-grown bamboo, and so he must eat more than double the weight he would eat in bamboo. It is not often that even a large Asian restaurant has eighty-four pounds of bamboo shoots, so we spend many Saturdays driving from restaurant to restaurant, waiting for tables and waiting to order, waiting for food. My Panda enjoys this very much, and thinks it is a great treat for me as well, even though I only eat at one or two of the restaurants. He says he likes to spend time together. I don’t have the heart to tell him I would rather cook at home and have the remaining nine hours for myself, although lately, I do appreciate how at the restaurants the tableware is well behaved, and doesn’t sing. Last Saturday, as my Panda was chewing his bamboo shoots inside the Super Happy China Buffet, and I was smoking a cigarette in the parking lot (a habit I have taken up just so I can get outside more on Saturdays), a bus pulled up at the station across the street, and I thought about getting on. It was an abrupt thought, but suddenly it seemed simple and possible. I would get on a bus. I would move to a new apartment where the cutlery was quiet, and the walls didn’t shake with constant crunching. I was half way across the street when I remembered that my Panda, having no pockets, had put his keys in my purse. I couldn’t leave him stranded, so I went back inside just to give the keys to the hostess. But Super Happy China Buffet is a very large restaurant, and the hostess was young and worried she wouldn’t know which panda to give the keys to; she insisted I point him out. And when I saw him, sitting alone at the table in out regular booth, waiting so patiently, looking with such hope at the steamer-tray where the bamboo shoots might soon be refilled; when I saw how he was chewing with his mouth closed as I have so often urged him to do at restaurants, I told the hostess not to bother. I put the keys back in my purse, and returned to my seat at the table, where my Panda was very happy to see me. Next Next post: Old English is NOT English!